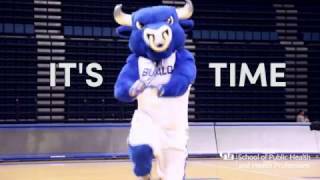 Learn how you can take part in the 2017 UB Step Challenge. UB's School of Public Health and Health Professions (SPHHP) will recognize National Public Health Week (NPHW) April 3-9 with a series of events that highlight and celebrate public health efforts important to improving the nation. Additional activities will also take place throughout the entire month of April to further expand the celebrations. The 2017 Step Challenge is the featured event for the NPHW celebrations. Free and open to the public, registrants may sign up individually or as a team and will be asked to log their step count once a week throughout the month of April. All participants will work toward reaching the collective goal of taking 200 million steps as part of this year’s challenge. Sponsored by the Office of Global Health Initiatives, the summit brings together practitioners, researchers, policy makers, resettlement and refugee communities to examine barriers, and explore solutions to culturally engaged health care provision for refugees. The summit will be take place on Friday, April 21, from 9 a.m. to 4:30 p.m. at UB's Educational Opportunity Center in downtown Buffalo. Sponsored by the Department of Rehabilitation Science, this year’s lecture will be given by Karen Jacobs, clinical professor of occupational therapy and program director of the online post-professional doctorate in occupational therapy (OTD) program at Boston University. Her lecture is titled “Cognitive Support Technology Approaches for Post-secondary Students with a Traumatic Brain Injury.” The lecture will take place on Friday, April 28, in 146 Diefendorf Hall on UB’s South Campus. Join us in the lobby of Kimball Tower every Thursday in April at 9 a.m. to participate in the Kimball Tower Climb. Participants will walk up and down Kimball Tower’s staircases in a fun and informative environment hosted by the SPHHP Dietetic Internship program. “Cowspiracy: How Our Diet Affects the Environment,” will take place on Monday, April 3, from 5-8 p.m. in 150 Farber Hall on UB’s South Campus. A panel discussion will immediately ensue the film screening. This event is hosted by the Community Health and Health Behavior Graduate Student Association. For a complete listing and further details on all events happenign as part of SPHHP's month-long celebration, visit http://sphhp.buffalo.edu/home/news-events/national-public-health-week.html.